NPS Park Ranger David Kilton delivers a fact-filled, yet entertaining, presentation on the building of the transcontinental railroad and the Golden Spike Ceremony at the spot where the last rail was laid while Central Pacific’s locomotive “Jupiter” waits to do a photo runby. [5/22/2012] © Copyright 2012, ChasingSteel.com. All rights reserved. May 10, 2019 will mark the 150th anniversary of the completion of the Transcontinental Railroad at Promontory Summit. The Transcontinental Railroad is one of the great technology marvels of the 19th century, connecting the eastern part of the country to the west. The railroad cut the journey from San Francisco to New York City from four months to less than three days. 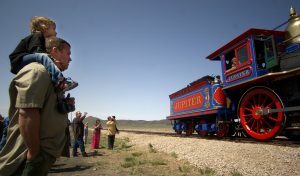 Richard Felt, of Brigham City, has been part of the Golden Spike reenactment for 50 years. Early on, he would go every night, including the weekend, to do his part portraying some of the original characters. Things have changed over 50 years and now he just does it on the weekends. The retired junior high teacher said he played the part for three years before he learned Harkness didn’t even have a beard. Over the years, Felt has played about every male character in the reenactment. This year, Felt will be a part of a bigger celebration, the Sesquicentennial of the driving of the Golden Spike and completion of the Transcontinental Railroad. 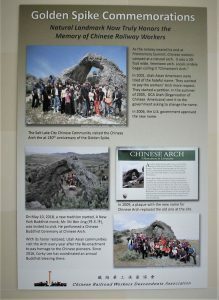 The Utah state capitol has large visuals displayed, with pictures dedicated to the Chinese contribution to the transcontinental railroad. Thousands of Chinese workers tunneled through mountains, built bridges and leveled the way for the joining of the railroads. The state capitol has large visuals, with pictures celebrating the Chinese contribution to the railroad. Thousands of Chinese workers, along with other workers, tunneled through mountains, built bridges and leveled the way for the joining of the railroads. Early Mormon Pioneers played a large part of building the railroad in Utah. However, Brigham Young was not happy when they built the railroad above the Great Salt Lake. He wanted the rails to go below the lake because it would bring more traffic to the new city. Governor Herbert has formed a commission to organize the sesquicentennial celebration. 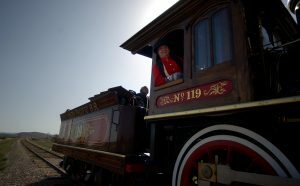 The celebration will begin on Friday, May 10 with replica locomotives Jupiter and #119 on site. There will be a keynote speaker and music performances, storytelling, historical reenactments, train demonstrations, a frontier village and steam train demonstrations among the activities. The celebration will continue through Saturday, May 11 and Sunday, May 12. The historic event will include a horse parade down Main Street in Brigham City at 1 p.m. showcasing the lifestyle of 1869, with authentic period dress and equipment from each of Utah’s 29 counties. After the parade there will be an evening of song and dance and a good old-fashioned hoedown at 6 p.m. at the Box Elder County Fairgrounds Event Center in Tremonton, culminating with a fireworks demonstration. They are also planning a children’s choir performance. Everything at the Golden Spike National Park is free, said Cache Valley native and Park Ranger Lucas Hugie. Information about how to purchase tickets can be found on the Spike 150 website. Please use the following link to find information about tickets and other facts about the event: https://spike150.org/faqs/. “Your vehicle ticket will give you entry for the performance,” Dodge said. More information about the events happening at Promontory Summit and across the state can be found at www.spike150.org. There are lots of fun and interesting events to celebrate this historic event going on across the state for the rest of the year. Hugie said they see about 60,000 visitors a year to the historic site.